New York City is full of hidden treasures. The lovely Merchant’s House Museum, located at 29 East 4th Street in historic NoHo, is one of our best. The Merchant’s House is easy to get to from most points in the city – just take the 6 to Astor Place or the N/R to 8th Street – and once you’re there, you’re in a really fun area of the city. The Merchant’s House Museum has been preserved intact and, walking into it today, it feels like you have stepped back in time. Bernice Abbott, Doorway: Tredwell House, 1936.From the Collections of the Museum of the City of New York. When Seabury Tredwell and his wife Eliza moved into the Merchant’s House in 1835, the “Bond Street neighborhood” was the most desirable place to live in New York. Wealthy New York families like the Astors and the Delanos lived just around the corner on Lafayette Place, and theatres and shops catering to an affluent crowd lined the Bowery and Broadway. It is no surprise that the Tredwell family chose to live in this house at that time. However, it is unusual that the Tredwells chose to stay after the neighborhood had become unfashionable and their neighbors moved further uptown. Because of the choice to remain forever in their house on East 4th Street, and because the Tredwells were an unusually long-lived family (many lived until almost 100 years old), the Merchant’s House was unwittingly preserved and has now become one of the true gems of New York City. The Merchant’s House is the most intact pre-Civil War house in New York City, boasting a relatively unaltered interior and exterior and most of its original furniture. Although the material items of the house are wonderful, the most special part is that it offers a rare glimpse into the real life of a wealthy New York City family in mid-19th century New York. Seabury Tredwell was a successful merchant – a product of the beginning of New York’s 19th century commercial explosion. Tredwell made his fortune as an importer of marine hardware, and retired to the Merchant’s House in 1835 when he was 55 years old. The Tredwells were wealthy enough by the mid 19th century boom of industry to enjoy the new consumer market of luxury products. Samuel H. Gottscho, The Old Merchant’s House, 1943. The Tredwell’s parlor is home to a suite of 12 chairs attributed to Duncan Phyfe. Phyfe is the quintessential example of a known master who entered the new age of manufacturing with a name already respected within the industry. The Tredwells regarded their Phyfe collection as one of their most prized possessions, and would have made it a point to place the chairs conspicuously at every party they hosted. The Tredwells were also proud of their “prefab” couches, which were made partially by machine. Although handmade goods are generally more elite and expensive, it is telling that, in this period of new industrialization, the Tredwells would have been smitten with the idea of owning the “latest and greatest” of the era. There were more benefits of having wealth in 19th century New York than access to fashionable furniture. One crucial advantage that the Tredwells had was that they were able to largely avoid the unsanitary, disease-filled conditions that plagued those who lived in close proximity to each other and did not have access to clean water. While many New Yorkers were pumping their water from the public “Tea Water” pump or from an unsanitary pump in the backyard of a tenement house, the Tredwells had a water pump connected to a private cistern that provided them with clean drinking and bathing water. The inadequate and dirty water supply was one of the biggest factors plaguing New York until (and even after) the Croton Aqueduct System dramatically improved New York’s water supply in the 1840’s. Contaminated water lead to issues with personal hygiene, dehydration, and the transmission of water-borne diseases such as cholera and yellow fever. The Tredwells had their water shipped in from the clean springs of the Hudson Valley and were thus sheltered from many of the hardships those with city water were facing. Not only did they have clean drinking water, they were able to take other hygienic measures like bathing properly, doing laundry, and cleaning their dishes in between each meal. The servants’ quarters at the Merchant’s House. Image courtesy of Softer City. The Merchant’s House is full of hints that the Tredwell’s servants were crucial to the daily running of the house. Call bells hang in the kitchen, signaling that the servants were at the Tredwell’s beck and call at all times. Even when the servants retired to their quarters, their work was never done. 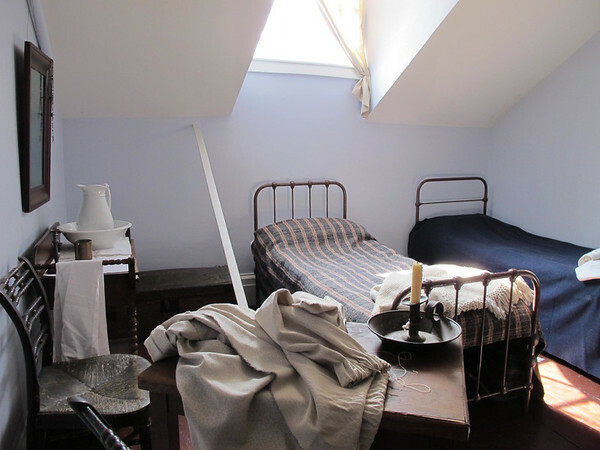 The servants’ quarters on the top floor of the Merchant’s House (not always, but occasionally, open to the public) are arranged so that the bedrooms encircle a central “work room” with a large table in which the servants would perform the additional tasks of the day, such as mending clothes and filling the oil lamps. The Tredwells are a typical example of a wealthy New York family who capitalized on the influx of Irish immigrants in the 19th century by hiring Irish women as maidservants. By 1850, 168,701 Irish immigrant women were working as domestic servants in London, and one can assume that the numbers were similar in New York at that time. The Tredwells had about four Irish female servants at any given time. These servants would be responsible for household chores including the Herculean tasks of laundry and cooking, the majority of child care, and attending to the constant stream of visitors who would come to call on Mrs. Tredwell. The tensions between the Tredwells and their servants frequently reflected the larger tensions of the city. The Tredwells were a staunchly Protestant family (Seabury was closely related to the first bishop of the Protestant Episcopal Church in North America), and, like many Protestants in New York, were highly suspicious of the Catholic Irish. Mrs. Tredwell was constantly paranoid that her servants were going to “convert” her children by planting Catholic ideas into their head, and she was unwilling to let her servants have time off on Saturday to make their confessions at Church. The Tredwells were undoubtedly an important and wealthy family in New York City in the 19th century, but they were not the most important or most wealthy. Although the Tredwell’s lifestyle certainly does not reflect what it was like for the majority of the population at the time, their story is not unique and other well-to-do New York families of the era shared many of their experiences. The insight that the Merchant’s House offers on the day-to-day life of the Tredwells and of their maidservants is both fascinating and haunting. After a tour of the Merchant’s House, soak up the spirit of the surrounding NoHo neighborhood, which borders Greenwich Village, the East Village, and SoHo. For a true New York favorite, walk 10 minutes south to Lombardi’s on Spring Street. I eat a lot of pizza, and Lombardi’s is one of my favorite places. It calls itself “America’s first pizzeria” (as a historian, I cannot confirm this) – it dates back to 1905, and their pizza is still made in the coal oven from this era. As long as you’re in the mood for Italian, end your pizza with a cannoli from Ferrara – by far the best cannoli in Little Italy, and probably the best in the city. There is a TON more to do in this neighborhood, and I hope to cover it all on this blog in time, but in the meantime a trip to the Merchant’s House and pizza at Lombardi’s sounds like a great little outing to me!